Sure, everyone thinks that building a street rod is about pistons, valves, gears, and tires. But there’s another side to street rod building, the “human side”. That’s what this story is all about. I retired from teaching in 2006. I knew I needed some sort of project to keep myself busy. First I thought I would get my pilot’s license and fly around the country. However, about that time, there was a small plane crash in the news. Well, I decided that type of project had a few too many risks. I kept asking myself, “What do I really like to do?” The answers kept coming up, I like cars, I like technical stuff, I like problem solving, I like to research and write, and I like show off my work. I mean, who doesn’t? After many discussions and a lot of wine with my wife, Renee’, I decided to look into the street rod industry. The more I studied street rods and the more street rod shows that my wife and I went to, the more I liked the field. While learning about this industry, I noticed that there was a complete spectrum of people who were street rod enthusiasts. There was the person who loved the technical the side of street rods. Then there was the person who just liked to drive street rods. And then there was the person who didn’t care about the technical side, but simply bought a street rod and showed it at all the shows. I thought with my technical interest, street rod shows, and driving a street rod, this industry indeed seemed to have what I really liked to do. And that’s when I decided to build a street rod. The first thing you have to do when building a street rod is to figure out what kind of car you want to build. But I had a lot of questions. Should I build a street rod from scratch? Should I look for an old car and rebuild it? How much will it cost? Will I like the style and design? Will the project keep me interested over a long period of time? Will I be motivated to finish the project? Are the parts available? Will my wife and two sons like the style I choose? To help with some of these questions, I heard about a retired sheriff who had a bunch of old cars for sale. When I went there, I was surprised to find out how many old cars he had. There were three big sheds filled with old cars. Most were in the late 1920’s, some convertibles and some coupes, some Chevy’s, some Fords, and some Pontiacs. Behind the sheds, there were piles and piles of stacked-up frames. Inside the sheds there were body parts hanging all over, mostly 1928-29 Ford body parts. After talking with the owner, and thinking about buying one of these old, “in need of great repair” cars, he said something interesting. He said, “If you like old cars and like working with rust, I’ve got just the car for you”. I thought a about my skills. Such a project would take skills like welding, sheet metal work, frame rebuilding, etc. I was a little light on these skills. He said, “If you don’t like those types of challenges, you better start with a new car, all new parts”. I wasn’t too hyped up about a 1929 Ford with a lot of rust. So, with his help, I think I made my first big decision; I’m going to build a completely new car, all new parts, and start from scratch. My second decision was, “what kind of car would I like to build?” Again, we went to more street rod shows. I read more street rod magazines. I knew one thing for sure, “I had to really like the design of the car”. But more importantly my wife had to like the design as well. Think about it. If she didn’t like the design, how was I ever going to convince her that I wanted to spend a significant part of the family budget on this project? Dahhh!!! I do understand the phrase, “Happy wife, happy life, and no street rod strife”! Looking at the 1932 Ford, and the 1933-34 Ford as potential projects, I realized that although beautiful vehicles, there were a lot of them out there. I kept looking for a style of car that I could call, “my dream car.” One that I would always see beauty in and one that would be a real “head turner”. After many street rod shows, reading street rod magazines, and talking with street rod enthusiast, I finally decided to build a 1937 Ford. I just loved its design. At the time, there were several companies that built the body parts for 1937 Fords. After a good deal of research, I decided to work with a company called, “Wild Rod” located in Canada. At that time, they had several companies around the United Stated that built the chassis for their cars. 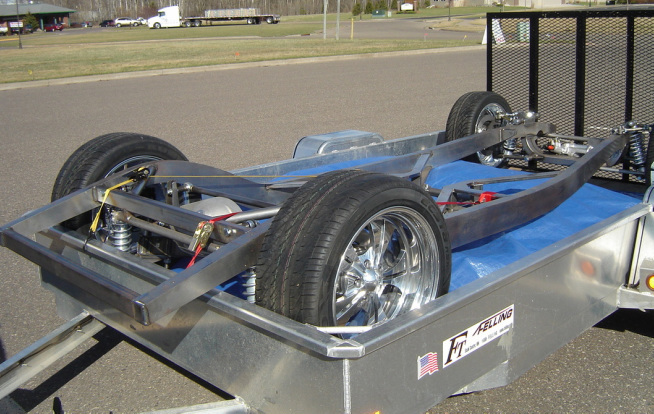 To get the chassis, I worked with a company called Performance Specialties Incorporated (PSI), near Madison, Wisconsin. They built the frame, set-up the suspension and steering systems, and put on Wilwood four piston brake calipers. I had to tell them what type of differential, what type of engine, the bolt pattern on the rims, and what type of transmission I was going to use. They built the frame so that each of these components would fit (engine and transmission mounts, differential housing, and axles). Just a side note, both of these companies went out of business within the few of years. I haven’t found out any information about what happened to PSI. However, a company called Customs Alley recently purchased the Wild Rod Company. Evidently, it’s not too unusual for this to happen. Anyhow, while PSI was building the frame, Renee’ and I were enjoying the nice winter weather in Scottsdale, AZ, about that time the Barrett Jackson auction was there. Who wouldn’t want to be at the Barrett Jackson show? What an experience. They were auctioning collector cars, street rods, muscle cars, etc. In fact, there were several 1937 Fords on the auction list. I just had to see what they were selling for. The prices varied, but some of them sold for more than $150,000. “Wow, did I make the right decision on what type of car to build”. Of course, then the recession hit and most of the prices went way down. Oh well, I still really like the design of the 1937 Ford. Luckily, I was able to have the tire company mount the tires on the rims and send them to PSI near Madison, Wisconsin. That was one slick deal. When we got back from our winter vacation in Arizona, it was time to pick-up the frame from PSI. I was getting really excited. I thought this is going to be an easy trip. Going to Madison is only about a seven hour trip. 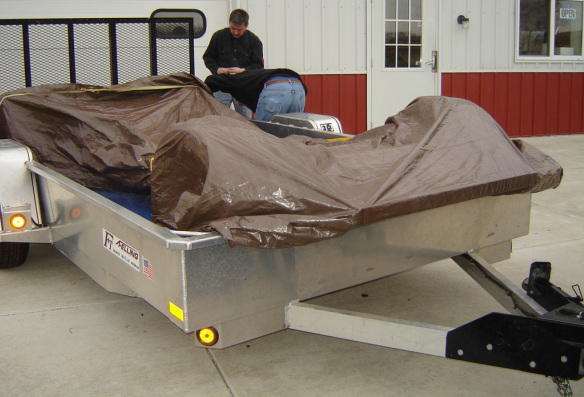 I’ll hook up my trailer and go pick-up the frame…...in early April…..in Wisconsin. We planned that Renee’ and I would take a nice one day drive down to see her sister near Rockford, Illinois, then pick up the frame near Madison on the way back to Minnesota. I didn’t even think about the weather. We left her sisters’ home on the second day and headed to Madison to pick up the frame. On the way there it started snowing. When we arrived at PCI it was a full blown blizzard, at least five inches on the ground so far. Now what? The tires were mounted on the rims, and I was happy about that. However, the frame and associated parts were all bare metal. Can you imagine the road salt and snow getting on and in all the nice new parts? Rust!!!! At that time, the owner at PCI talked me out of hauling the frame back to Minnesota. We headed home in the blizzard without the trailer and rolling frame. Maybe next week!!! I was very depressed. My wife tried to cheer me up by saying, “Well, at least I got to see my sister again?” Right!!!!!! Two weeks later, after the weather warmed up and the snow melted, we headed back to Madison, Wisconsin. The trip was an easy drive with no snow or rain to contend with. We rolled the entire frame onto the trailer, secured it, and headed home. It was an uneventful trip. Here are a couple of photos of the car before we left PCI. We finally got home and put the chassis in my “man cave”. By that time, I had already completed the rebuilding of the engine and transmission. In fact I had the transmission already attached to the engine. My next big project was to get the engine and transmission mounted on the chassis. After solving a few alignment problems everything went together as planned. I was really getting impatient though, and wanted to see how the engine ran. But I didn’t have a radiator. I couldn’t order a radiator until I had the body parts. I wasn’t going to wait that long. It might be several months to a year before I get the body parts. I solved my impatience by going to a salvage yard and getting a temporary radiator that could be used just to see if the engine ran right. It ran just like it was supposed to. I was pleased with my progress! I didn’t have the money at this point to buy the body parts, but there were many other “lesser” expensive projects that I could be working on. “Lesser” is a figure of speech. It means less than the $11,000 for the body parts of the vehicle. With this type of costs, I better like the style of the car a whole lot. Some of the lesser projects: I put in the fuel tank, ran the fuel lines, installed the master cylinder, designed and built the hydraulic brake lines, added the proportioning and residual line valves, installed the differential, installed a transmission cooler, installed the shift linkage and neutral safety switch, and had the exhaust system built. In addition, there were many other even smaller projects that had to be completed before the body parts were purchased. Before I purchased the body parts, I had about $21,000 wrapped up in the tires/rims, chassis, and many other component parts. Before the chassis was ready for the body parts, I became impatient again. I kept wondering, "Could I drive the vehicle at this point?” I wouldn’t go far, just enough to see if the whole chassis worked together. We have a small private road in front of the garage. I said to myself, “I’ll only drive it up and down the road once”. I won’t even heat up the engine. So I set up a small bench where the front seat driver seat would be, still with the temporary radiator, and tried it out. To my amazement, the car ran just fine, only a few minor adjustment needed to be made. I've satisfied my impatience again. It was about time to order the body parts from Wild Rod. I worked with the president of the company to keep the cost down. One way he suggested was rather than shipping the body parts from Quebec, Canada, (which would increase the costs); he would be willing to trailer it to the Chicago area. I would then have to make arrangements to get the body parts home from there. What a challenge. I had a friend who owned a trucking company in Minneapolis. He also had a shipping terminal in the southern Chicago area. This might work out ok after all. After many phone calls, it was agreed that Wild Rod would ship the entire package of body parts to southern Chicago area, and my friend would have it shipped from there to the Minneapolis terminal. All I had to do was get my trailer down to the Minneapolis terminal and pick up the body parts. Once I arrived at the Minneapolis terminal, the entire package was put on my trailer and I headed home. All of the body parts were wrapped in bubble wrap and placed on a wooden skid. The parts included the following: the main body and floor, four fenders, trunk lid, hood, hardtop, front engine panels, grill, two doors, two windows, power window kits, the center console, two running boards, front window, and rear window. Here is a photo of the entire package after I finally arrived at home. Getting the entire parts home was like having Christmas in June. About this time, I realized something very important. What if my “man cave” burned down? What if someone broke into it and stole the entire chassis, body parts, and engine. What if a tornado took it all away? This stuff does happen. What was I thinking; “I need insurance on this car now”. I’ll just call my insurance company and get it covered by an insurance policy. Oops, a major setback!! I immediately found out I needed a VIN (Vehicle Identification Number). I have a lot of parts in my “man cave” but no VIN. In fact, I couldn’t get a VIN in Minnesota until I have a completed vehicle. That’s a long time away, possibly a year or more. After doing more research, I came across an insurance company called Hagerty. They were absolutely great to work with; they specialize in such projects. I had to show them how much I had spent on the car at that particular point in time. I had kept all of my receipts up to this point, recording them on an Excel spreadsheet. I sent them receipts and photos to verify that I actually had spent the money. I was about $32,000 into the project by this time and still no VIN. They were happy to write an insurance policy for $32,000, and this was just protecting the amount of money I spent up to this point. However, this wasn’t protecting the hours of labor I had into the project. As I spent more on the project I was able to change to insurance policy. Every $10,000 I spent, I sent in more receipts and pictures. Hagerty changed the policy accordingly. Like I said, I was just protecting the amount of money I spent as I went along. Looking back, I believe I should have purchased the insurance much earlier. Once I had all the body parts home, my next major project was to get them to fit together correctly. After working on the body parts for a couple of months, I ran into problem. 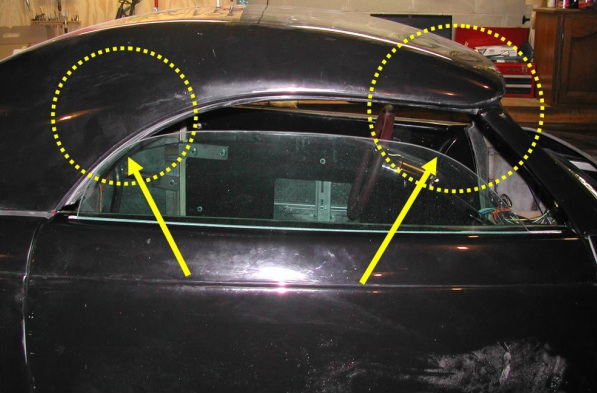 The shape of the side windows didn’t match the shape of the roof as shown by the yellow arrows and circles in the photo below. After a little research I realized that the windows were for a 1937 Ford “coupe” rather than a hardtop convertible. Thinking there would be no problem, I called the company to get them exchanged. Guess what, the company had gone out of business. Great! Just really great! Luckily, I had the home phone of the past president of the company. After telling him my story about the windows, he agreed to get a new set of windows sent to me immediately. After several months of phone calls, an associate of his, picked up the two windows and brought them to Montreal. Then a FedEx agent picked them up in a snowstorm and sent them to my home. I guess I was just lucky to get the windows. By the way, the new ones fit perfectly. But I still have the two coupe windows packaged up and sitting in my “man cave.” Unless I can sell them really cheap, I’ll probably have them for many years. Over the next 15 months, I worked on getting all of the body parts to fit, getting all of the electrical systems working correctly, getting the stereo system installed, installing the air conditioning and heating systems, installing a windshield wiper system, installing all gauges, carpet, safety belts, door locks, inside upholstery, etc. 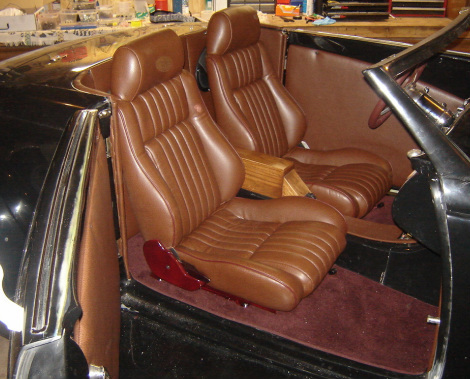 Speaking of upholstery, when I was ready for the seats, I measured the width I had available. Because of the center console, there was only 19 inches of space for each seat. My intent was to find a set of seats that would fit and then have them reupholstered by a professional. I looked long and hard for a set of usable seats. Most were at least 20 inches of more in width. While visiting my son in Minneapolis, we decided to go to a salvage yard called, “You Pull Our Parts.” Yes, that’s the correct title. There was a hard rain when we got there. The place was packed. They gave each customer a wheel barrow to put their parts in. We found a 1985 Pontiac Fiero that had the right width of seats. The runners under the seat were also in great shape. We put the seats in the wheel barrow and went to check out. We paid $36.00 for both seats. I found an upholstery shop called Custom Upholstery and Awnings Shop in Baxter, Minnesota. They used the torn and ripped seats for patterns. Here’s how the seats look now. Not bad, coming from a salvage yard. Jump ahead two years and the “Wild 37” has been completed, tested, and shown in local and regional car shows, getting several trophies and awards along the way. I joined a car club in 2011 called “River City Street Rods” from Hudson, Wisconsin. They have a great car club and are very active with many events each year. They have a spring “bud” run and a fall “leaf” run. While on our first fall “leaf” run, about 35 cars were driving up north to Cable, Wisconsin; just 35 beautiful cars running the back roads….with people enjoying the fall leaves and rolling hills and valleys of Wisconsin…35 cars with street rod enthusiasts having a good time….and one car hitting a deer. I hit the brakes but it was too late. The deer jumped in front of the car and hit the left front fender. How could this happen? Thirty-five cars and I hit a deer!!! The car was still able to run, but the left front fender had quite a bit of damage. The damaged also included many hairline cracks in the paint and fiberglass. We finished the “leaf’ run, and when we returned, I removed the left front fender and had it repaired. All in all, this whole experience has been an incredible one. Even though I built two cars before starting the 1937 Ford, building this street rod was a totally new learning experience. One way to look at this project; it’s a good alternative form of life insurance. It keeps my mind and body active, I feel good about what I’m doing, I have something to look forward to each day, and I can’t wait to start another one. At least I’m not a couch potato.